AFL fans rode a wave of emotion last September with the Richmond football club winning the 2017 AFL Grand Final, beating the Adelaide Crows by 48 points. The MCG is often referred to as the spiritual home of sport in Australia and AFL Grand Final Day is one of the biggest days on the sporting calendar. For Orrcon Steel, our most memorable goal came prior to the 2006 Melbourne Commonwealth Games. We take a trip down memory lane, reflecting on one of the biggest redevelopments of this iconic sporting venue. Working alongside Alfasi Steel Constructions, Orrcon Steel was part of a $434 million facelift of the Northern Stand. This project reaffirmed the MCG’s standing as one of the world’s great sporting icons. 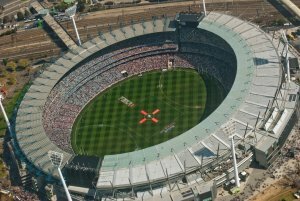 Today the MCG holds 100,024 spectators and is the first stadium in the world to have its annual number of visitors equal or more than the city’s population. The main roof has 1,100 tonnes of structural steel and 5,300 lineal metres of steel cable. For more information on Orrcon Steel’s products call 1300 665 757.